I’m finally at the stage where I feel like I can finally think about decorating a nursery. I’ve collected inspirational pictures for a while and throught I’d round them up here to share with you! I love the dark grey accent wall and bright colors of this room. The handcrafted details make it feel so cozy and inviting. This is just so gorgeous and feminine and soothing. I LOVE that 3D tree and the lavender color palate. Now that our living room is purple, though, I’m not sure I want a purple nursery. My favorite part of this nursery is the textiles. I’d love custom bedding and drapery, but we’re on a serious budget, so we’ll either go very cheap or very DIY (or both). Doesn’t this room make you want to curl up with a book and mug of hot cocoa? I love the fabrics and neutral grey walls. I am definitely doing bookshelves like these on one wall of the nursery. I found white picture ledges for cheap at Ikea and I’m going to collect my favorite picture books to display on it (maybe a shower theme? bring your favorite children’s book?). I love the color of these walls and that soft white rug, but I’m scared of white rugs, especially with two dogs, so I’m not sure about that. I also like the pops of green, yellow, and orange and that cute lamp. I am really liking big wide stripes right now and these in shades of blue are just lovely. I really like the reclaimed wood wall in this room, but my husband has already vetoed it. It’s a lot of work and I might get sick of it quickly, so I see his point. But isn’t it cool? 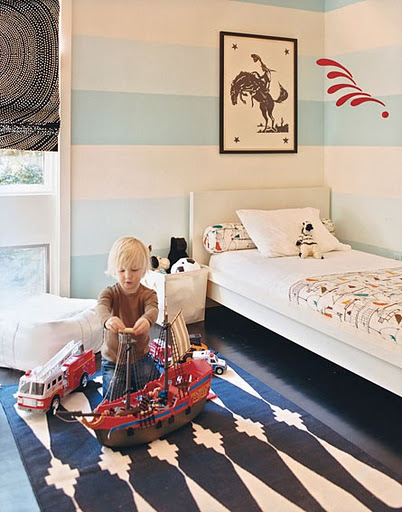 I’ve always liked the idea of doing a sea themed boy’s room. I love that mobile and the soft blue walls, but other that that it’s a little too simple for my taste. What do you think? Any of these catch your eye? I love the boy nurseries! Especially the 1st one with the stripped wall and horse picture. Love it, love it, love it! So cute! It inspires me just to have more of a design in my house! It's hard for us cuz our place is so small and it always feels cluttered with all our crap! We need to get rid of stuff!I love the book nursery…I always imagine reading to my kids one day and that nursery looks like a dream library for kids!